How you spend your time tells everyone what is important to you. When you are your own boss, and maybe even the only one in the company, no one tells you when to or how to focus on the most important things. Focus is a do-it-yourself project. no interruption” time to focus. It takes time to develop this skill. 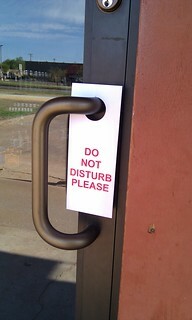 It takes locked door, no interruption time. An hour a week would make a huge difference. But an hour a week sounds hard, when you already are working 50 to 60 hours a week, like many entrepreneurs. Hire or bribe someone to sit in for you for an hour. How do you spend the time? Here are five tasks you can work on during your precious focus time. Stop doing some tasks. Spend some of your thinking time to make some careful choices. Ask, “what would happen if I just didn’t do this?” Think through the consequences, and give up some things. Pick one skill to improve. What’s the one thing, that if you were better at it, would definitely improve your bottom line? Spend your hour reading and studying. Not surfing the internet looking for something about it, but studying. If what’s important to you is revealed by your calendar, then isn’t improving your business worth one hour of focused time per week? I’m considering creating a new paid course on productivity and getting your work done. Would you be interested? You can let me know at this Productivity Course Survey. Good morning! I really like the idea of scheduling a meeting with yourself. Even if it’s only twice a week, I can see where that would have an impact. Thank you for the tip! Sorry about that confusion, Tracy, but it is good to see your smiling face!